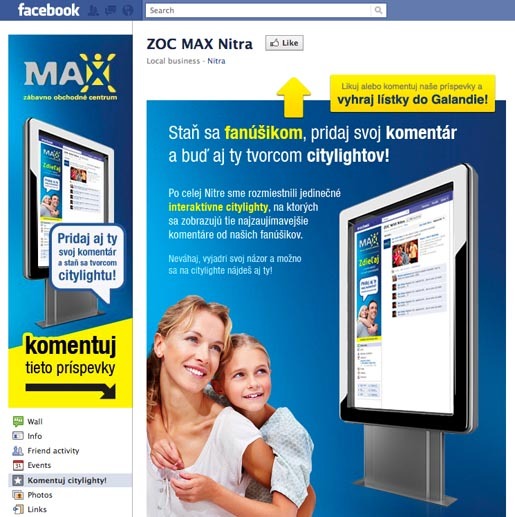 ZOC MAX Nitra, a shopping centre in Nitra, Slovakia, connected shoppers, fans and pedestrians together through Facebook and citylight advertising. Interactive citylights mirrored activity on the Facebook page, encouraging shoppers to “Share with us the joy of brand new shops”. The Citylights campaign was developed at A.S.A.PRINT, Trencin, Slovakia, by copywriter/graphic designer Andy Abel, graphic designers Michal Pačesa and Denis Weber.